“The horrid and murderous system of duelling has found its way to this Colony under the hypocritical name of honour.” So said Joseph Hardey, who built Tranby House on the Maylands Peninsula. Hardey referred to the only duel in Western Australian history—that between George French Johnson and William Nairne Clark. George, a Fremantle merchant, had been at loggerheads with William, a solicitor, for some time. Heated insults were often exchanged between the pair. Matters came to a head on Thursday, 16 August 1832. William once again approached George and insulted him in front of several witnesses. At the time George said nothing, but simply walked away. 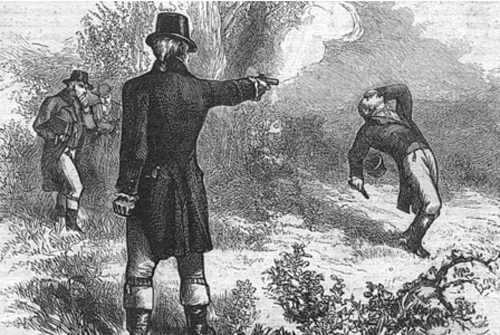 But the next day William was informed George wished to settle the argument in a duel. The challenge was accepted and the place was fixed at the back of house near Cantonment Hill, Fremantle. At the appointed hour next evening, the two duellists selected their pistols, went to opposite parts of the yard and, standing side-on, fired when the signal was given. George fell instantly, with a gaping wound in his thigh. A doctor was hurried to the scene and the wounded man taken to hospital. But just twenty-four hours later he died. William was immediately arrested and tried for murder. Strangely, and despite the rigid laws governing duelling, he was found not guilty.